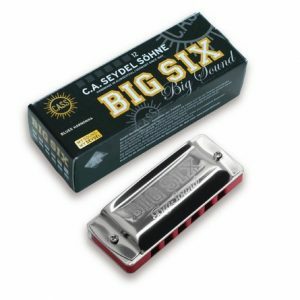 Set of six, Big Six harmonicas in keys of C, A, Bb, D, F and, G.
The Big Six has been very popular but players kept asking for other keys besides C. Seydel listened, and has now produced as a set of six, with the keys of A, Bb, D, F and, G, including the C.
The Big Six, is a six holed diatonic harmonica, which keeps the lower range of notes as a ten holed harp. Each key comes in it’s own distinctive colour, black comb G, lava comb A, sky comb Bb, olive comb C, yellow comb D, white comb F.
The reeds are of stainless steel on a nickel silver plate, for longer life and a brighter tone. 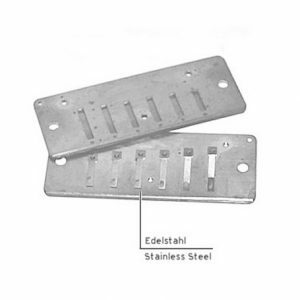 The cover plates are of tough, polished stainless steel, mounted on a solid plastic-polymer comb. 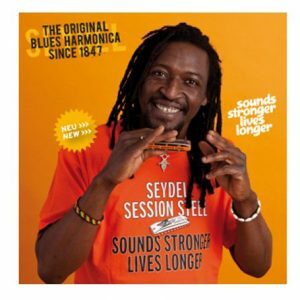 The set comes in a Big Six Belt Bag and also includes; a neck strap which attaches to a pin on the harp; a multimedia tutorial on a chrome plated USB stick, which features Blues titles in six different keys and extra information.